In many instances, the first time one has any contact with the legal system, is in the context of a divorce or family related legal problem. These matters often involve highly emotional issues, personal and financial stress and can involve changes in family structure and daily life. Separation and divorce has become ever more complex in our society and can involve complicated issues of asset valuation and distribution, pension analysis, spousal support or alimony, continuation of health insurance coverage and attendant tax considerations. A determination of a lasting and equitable parenting plan for children with adequate provision made for their financial security, may be the single most important decision for parents going through divorce. Attorney Garner has more than thirty years of experience handling divorce and custody cases. As a former Court certified Guardian Ad Litem who has represented the interests of children in contested cases, Attorney Garner can bring a unique perspective to any custodial dispute that you may be facing in your case. As a trained family law mediator Attorney Garner can bring to the table communication skills and negotiation techniques that will bring about effective settlements of disputed matters. In most situations, equitable parenting, support and property division agreements can be negotiated and presented to the Court for approval. With a negotiated settlement, the parties can fashion their own parenting plan which usually is preferable to having a Judge make decisions for your family. Agreements can reduce the emotional anxiety accompanying divorce and limit financial costs including legal fees for both husband and wife. Proper advice and counsel is essential in order to have a complete understanding of the issues in your case and to assist you in arriving at an equitable resolution and one that is within the boundaries that the Court would order. Negotiated agreements can be reached through a more traditional model of divorce representation, where the option of contested litigation is always available if settlement breaks down, or can be accomplished by alternative forms of dispute resolution. Mediation is one of these methods of resolving family disputes. Attorney Garner can represent your interests in preparing for and attending mediation or can serve as a neutral mediator in your case. For many families’ divorce and family law disputes can be effectively resolved through the Collaborative Law process. This is a cutting edge trend in the family law field that is designed to bring less adversarial conflict and emotional heartache to the process. It is designed to offer families a more sane and positive method of resolving problems within families whether that involves a divorce or other matter. Often the Collaborative process can even be less expensive that the traditional litigation model. 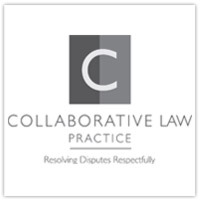 For those potential clients with an interest in exploring the possibilities and benefits of Collaborative Law please return to the practice areas home page and navigate to the Collaborative Law section of this website. When it appears that the parties are unable to reach a fair negotiated settlement, Attorney Garner is capable of providing skillful representation and will bring your case to trial in an expeditious manner. Over thirty years of experience has helped him recognize when a case needs to be brought to trial so as to obtain a fair and just result for his client. At each stage of the proceeding, you will be informed of the status of your case, the likely next step and what to expect from the litigation process from beginning to end. Confidentiality of communications with our office is assured so as to provide you with the privacy and discretion needed in this sensitive area. If you are considering divorce or are facing other difficult family law disputes involving parenting, support or other unresolved issues please call (603) 882-8008 or contact chris@attorneygarner.com to schedule an appointment today to learn more about how we may be able to help you. Nashua, New Hampshire and statewide divorce and family legal services providing advice and representation for all divorce, contested divorce and litigation, parenting, parental rights and responsibilities, paternity, custody, visitation, alimony, child support, property settlement, modification of orders, prenuptial agreements, relocation cases, grandparents rights and more. Get an attorney with the experience, dedication and ability to get you the results you and your family deserve. Collaborative practice is a method of resolving family law matters using a structured negotiation setting, without going to court. In collaborative practice, which is also known as collaborative divorce or collaborative law, each party is represented by his or her own lawyer. Both parties and both lawyers, often also with divorce coaches or other professionals, meet together to develop information, identify interests and goals, and formulate solutions to the problems presented. Voluntary. Participation in collaborative practice is completely voluntary. No court, no judge, and no law can require anyone to select collaboration. Confidential. The parties, attorneys, and other professionals participating in a collaborative case sign a formal agreement to hold all communications and documents entirely confidential, so that nothing that transpires in the collaborative process can be used in any legal proceeding. Courts will enforce these confidentiality agreements. Non-adversarial. Collaborative practice is a serious, good-faith effort to find productive, useful solutions to family law issues. While disagreements and differing viewpoints are expected, hostility, attack, belligerence, and bad faith are unacceptable. Open and transparent. Parties in collaboration voluntarily provide all information and documentation needed to address the issues at hand. Nothing is hidden or concealed. All negotiations are in the open. Attorneys do not negotiate out of the parties’ presence. Interest and goal based. Parties, with the assistance of attorneys and divorce coaches, identify their interests and goals, both personal and financial, so that, working together, the collaborative team (parties, attorneys, and coaches) can develop solutions that address those goals and interests. I want to maintain respect for my spouse or partner, even when we disagree. I want to place the needs of our children as a first priority despite our differences as parents. I will listen objectively to the needs and concerns of my spouse or partner and believe that we deserve equal consideration. I believe that working creatively and cooperatively solves problems. I am committed to looking beyond today's frustration and emotional pain so we can each plan for the future. I can behave ethically toward my spouse or partner in the process. I want to maintain control over the process of our divorce or family dispute and avoid resort to the Court process that takes time, is destructive and often costs considerably more than the Collaborative model. If this method of resolving differences and solving problems sounds beneficial to you and your family set up an appointment and free consultation with Attorney Garner to discuss how best to move forward. Mediation is a method of resolving divorce and other family disputes in a manner that is more cooperative, less expensive and provides for better outcomes helping families restructure their lives. Mediation allows the parties to mutually and efficiently resolve difficult financial, parenting and other family issues in a cooperative rather than a competitive struggle. Unlike the adversarial process mediation offers a personal and private approach to resolving conflicts designed to avoid the destructive and damaging effects of litigation that can have lasting and lifelong negative impacts. For those considering mediation Attorney Garner is trained to serve as a mediator who can facilitate a resolution for you. The Garner Law Office can also represent you to prepare for your mediation and be there with you during the mediation process. Attorney Garner has received extensive training in family mediation, has been participating in and serving as a mediator throughout New Hampshire and has the unique perspective of a family law attorney with over 30 years of experience to guide you through the process. The client’s fears, beliefs, concerns, values and ideas are paramount. The vast majority of people facing divorce and difficult family disputes seek to work cooperatively to create a settlement and it is the litigation and adversarial process that encourages them to behave in a combative manner. The adversarial system is harmful to families because it focuses on winning rather than on what is best for individuals, children and families. Cooperation can be learned by those who are embroiled in conflict and divorce if they choose to function in an environment that imposes the elements of cooperation rather than the elements of competition. Parties in conflict can achieve a resolution that is acceptable to both when the process emphasizes similarities and shared needs rather than their differences. If you are considering divorce or are facing other difficult family disputes involving parenting, support or other unresolved issues please call or schedule an appointment today to learn more about mediation services and how they may be able to help you settle your differences cooperatively. Not having enough money to pay the bills and wondering how you will get by can be very stressful. There are options for honest individuals, families and small business owners overwhelmed with debt and looking for solutions. Bankruptcy may be one of them. A decision to file for bankruptcy should be made only after determining that bankruptcy is the best way to deal with your financial problems. Attorney Garner has more than thirty years of experience practicing in this area and can assist you in determining whether bankruptcy is an appropriate option for you and if so, what type of bankruptcy should be filed. There are generally two types of bankruptcy cases that an individual or small business owner would consider. Chapter 7 is liquidation bankruptcy which, in theory, means creditors are paid through the liquidation of the debtor’s assets. However, despite common perception, most people who file for Chapter 7 bankruptcy are able to keep their assets. There are certain types of property that are protected by law and thereby exempt from creditors. New Hampshire allows you to use the exemptions found in the U.S. bankruptcy code (11 U.S.C. §522 (d)) or the exemptions provided under New Hampshire law. Under New Hampshire law debtors are in most instances entitled to keep all their property. Unlike Chapter 7 bankruptcy, the Chapter 13 debtor does not liquidate his assets but instead creates a debt repayment plan. Under the plan, creditors are paid based on the amount of income available after the debtor’s living expenses are taken into account. Over the period of three to five years a percentage of the debt will be paid to creditors through the plan. In many cases the debtor pays back less than 1% of his unsecured debt, with the remainder discharged at the end of the plan. In order to be eligible to file for Chapter 7 bankruptcy the debtor has to pass what’s called the “Means Test”. If the debtor does not meet the “Means Test” requirements, the debtor will not qualify for a Chapter 7 discharge and would instead be required to make payments on the debts through a Chapter 13 Bankruptcy plan. On the other hand, there are instances where debtors who qualify for Chapter 7 bankruptcy may opt to file a Chapter 13 when they have assets that would be exposed in a Chapter 7 and wish to keep said assets. Chapter 13 is often a good option for those who have fallen behind on secured loans such as mortgage or car payments. Attorney Garner can assist you in making the tactical decision of which chapter to file. Attorney Garner is available to speak with you by phone or to meet with you at a free office consultation to discuss your particular financial needs and circumstances. Such an evaluation will give you an idea as to your eligibility for bankruptcy relief, what type of property you are entitled to keep following bankruptcy, what will happen to your home and car and the effect of bankruptcy on your ability to obtain credit in the future. The Garner Law Office has been designated by Congress as a debt relief agency offering bankruptcy relief and protection helping clients file for bankruptcy. If you are considering filing for bankruptcy contact Attorney Garner for a free consultation on your options and alternatives. Learn more about the different types of bankruptcy by reviewing the information concerning each type of bankruptcy in the information that follows. Chapter 7 is liquidation bankruptcy which, in theory, means creditors are paid through the liquidation of the debtor’s assets. However, despite common perception, most people who file for Chapter 7 bankruptcy are able to keep all their assets. There are certain types of property that are protected by law and thereby exempt from creditors. New Hampshire allows you to use the exemptions found in the U.S. bankruptcy code (11 U.S.C. §522 (d)) or the exemptions provided for under New Hampshire law. What happens to my debt in a Chapter 7 Bankruptcy? Chapter 7 Bankruptcy allows the debtor to eliminate a majority of his debts through “discharge”. Some examples of dischargeable debt include credit cards, personal loans, medical bills, judgments, and business debts. However, filing for Chapter 7 Bankruptcy in some cases will not eliminate all of a person’s debt. Examples of debts that are non-dischargeable are most taxes, most student loans, and child support/alimony payments. Despite having non-dischargeable debts, the discharge of the other debts will make management of the non-dischargeable debt much easier. Debtors must qualify to file a Chapter 7 Bankruptcy. Under the Bankruptcy Abuse Prevention and Consumer Protection Act (BAPCA) a person must pass the “Means Test” in order to be eligible to file for Chapter 7 bankruptcy. The “Means Test” looks at the debtor’s household income over the past six months. If that income is below the median, the debtor is automatically eligible to file for Chapter 7 bankruptcy. If it is over the median, the debtor’s expenses are then calculated in. If the debtor still does not meet the “Means Test” requirements, the debtor will not qualify for a Chapter 7 discharge and would instead be required to make payments on the debts through a Chapter 13 Bankruptcy plan. What happens once I file? As soon as the debtor files for Chapter 7 bankruptcy, an “automatic stay” goes into effect. This means that all your creditors must stop trying to collect on the debts and cannot contact you. Upon filing, the Court will assign a trustee to oversee the case. The trustee will set up a “first meeting of the creditors”, also known as a “341 meeting”, usually within a month or so of filing. The debtor must attend the meeting. The creditors are invited to attend, but do not have to. In fact many do not. At the meeting the trustee and creditors can ask the debtor questions about the debt. The trustee and creditors then have 30 days to object to any exemptions claimed by the debtor and 60 days to challenge a debt’s dischargeability. On average it takes about 5 months from the date of filing to receive a Chapter 7 discharge. Chapter 13 is often a good option for those who have fallen behind on secured loans such as mortgage or car payments. Chapter 13 also is a good option for those with 2nd and 3rd mortgages or equity lines that are no longer secured by the value of their home and “underwater.” In those instances it is possible to “strip” and eliminate those debts entirely. In some instances, debtors who qualify for Chapter 7 bankruptcy may opt to file a Chapter 13 when they have assets that would be exposed in a Chapter 7 and wish to keep those assets. Attorney Garner can assist you in making the tactical decision of which chapter to file. What happens to my debt in Chapter 13 Bankruptcy? While Chapter 13 is capable of reducing or even eliminating many debts, there are some debts that cannot be discharged. These non-dischargeable debts include most taxes, most student loans, and child support/alimony payments. However, even debts that may not be discharged at the end of the plan can be made part of the plan, helping you to reorganize and manage your debt. To be eligible to file for Chapter 13 bankruptcy the debtor must be an individual. Chapter 13 also places limits on the amount of debt the filer can have. Lastly, unlike Chapter 7 Bankruptcy there is no “Means Test” for Chapter 13 bankruptcy. However, a Chapter 13 debtor must have a regular income above and beyond what is needed to pay their living expenses. This ensures there is money available to be paid into the plan. Once the Chapter 13 bankruptcy petition is filed the “automatic stay” goes into effect. This means creditors must stop their collections efforts. Along with the petition the debtor must submit a repayment plan. The plan provides for fixed payments to the trustee on a regular basis, usually monthly. The trustee distributes the funds to the creditors in accordance with the plan. The first payment becomes due within 30 days of filing the plan. As in Chapter 7 bankruptcy, a “meeting of the creditor” also known as a “341 meeting” is held. The debtor must attend and the trustee and creditors may ask questions of the debtor concerning his finances and the plan. After the meeting, the bankruptcy court must approve the plan. Once the plan is confirmed by the Court, the debtor is required to make regular payments to the trustee as provided in the plan. If during the pendency of the plan your situation changes, you can propose a possible modification to the plan. Upon successful completion of all payments under the plan, the debtor will receive a discharge. If you are considering filing for Chapter 13 Bankruptcy, The Garner Law Office can discuss with you your options and alternatives. When someone has been injured as a result of the carelessness of others or hurt while at work, significant disruption in ones life and that of their family can occur. The physical pain and injury itself is usually accompanied by lost wages, increased expenses in the form of medical bills and confusion concerning what steps need to be taken to protect your interests and obtain fair compensation for your losses. If you have been injured as a result of the negligence of someone else, New Hampshire law provides that you are entitled to full, fair and reasonable compensation. Personal injury cases may involve automobile accidents, slip and fall occurrences, defective products and medical malpractice. In all personal injury matters, representation is provided on a contingent fee basis, which means that no fee is earned unless you receive a favorable settlement or judgment. Being involved in a personal injury case can involve great personal grief and crisis. Victims of accidents need to obtain competent counsel who can offer their professional judgment and guide them through the maze of insurance carriers, medical providers and the Court system. In most cases, a fair recovery can be obtained through negotiation which leads to settlement without the necessity of appearing in Court. In other cases, however, vigorous representation in the Court system may be necessary to obtain a just result. Attorney Garner is available to speak with you by phone to immediately assess your needs and to make arrangements for a free consultation in the office, at your home, or some other convenient location. If you have been injured while at work, there is a distinctly different process to obtain reasonable compensation and benefits as compared to some other injury such as an automobile accident. In that type of case or in a slip and fall occurrence or medical malpractice action, the victim of the injury has the burden of proving that someone else caused the injury by their negligent conduct or carelessness. If you are injured at work, you are entitled to certain benefits regardless of whether there is any fault on the part of anyone. The purpose of the theory behind the worker's compensation system is to provide immediate help to the injured worker without the requirement that he or she prove that someone else's conduct caused the accident. While an injured worker does not need to prove fault under this system of recovery, there are limitations to the amount and type of benefits one is entitled to. For example, in a worker's compensation case, there is no recovery for damages such as pain and suffering or for the full recovery of lost wages. The worker's compensation system limits compensation for lost wages to 60% of a worker's average weekly wage. The processing of worker's compensation cases in New Hampshire is administered through the New Hampshire Department of Labor. While the worker's compensation system is often thought of by an injured worker as a "user friendly system", insurance carriers and employers routinely have the benefit of competent and experienced legal counsel to represent their interests. Except in limited circumstances, it is in the best interests of an injured worker to obtain their own representation that can adequately explain your entitlement to benefits and proceed expeditiously in obtaining the full range of benefits that you are entitled to. Victims of work related injuries are entitled to four basic types of benefits. If you are hurt at work and the injury is causally related to your employment, you are entitled to receive 60% of your average weekly pay for the period you are out of work. This is your weekly disability payment. Computation of your average weekly wages may be complicated by the manner in which you are paid, by the number of weeks that you have been employed at that position and would depend upon whether you are working more than one job. In addition to disability pay, you are entitled to have all of your reasonable and necessary medical expenses paid by the employer or their insurance company. There are specific limits as to which doctors or health providers an injured employee can see and at what rate the insurance carrier will pay these bills. There is also a provision in the law for reimbursement of mileage expenses for travel to and from medical treatment, as well as reimbursement for any medication and other necessary health aides. If your injury results in a permanent impairment, you may be entitled to receive a permanent impairment award. For example, if you were to lose a certain percentage of the use of your hand or leg as a result of an injury, you would receive a monetary payment. Under the New Hampshire system, not all permanent injuries result in an impairment award. The nature and extent of the permanent impairment must be determined by your doctor. It is important to note that in many circumstances, the insurance company and/or employer, will not disclose to you, that you are entitled to benefits under this provision of the law. Finally, if you are unable to return to your previous job, the employer and insurance company involved has an obligation to assist with vocational training and job placement assistance. Vocational rehabilitation may involve trying to find you a different job at your old employer, finding you a new job at a new employer and may also involve educational training and assistance. Attorney's fees in worker's compensation cases are similar to other personal injury matters in the sense that they are contingent upon a recovery by the injured party. In the area of worker's compensation, the New Hampshire Department of Labor is responsible for administering and overseeing the payment of attorney's fees. Attorney's fees in a worker's compensation case are typically 20% of the benefit received whereas in more standard personal injury matters, the contingent fee is generally 33% or higher. As with any personal injury matter, Attorney Garner is available to provide immediate information to you over the phone and can set up a free consultation in the office or at your home on a schedule which is convenient for you. Benjamin Franklin said, "The only things certain in life are death and taxes." A well-crafted will or estate plan is your assurance that your property and possessions will be passed on to those whom you choose and that the taxes and costs associated with your death will be minimized. Even a well-designed estate plan can falter due to inadequate administration or unfamiliarity with the process. Although most people only need simple wills, some problems in estate planning can be daunting and complex. In addition to financial considerations, it is important for parents of minor children to select a guardian for their children in the event of the untimely death of the child’s parents. This can be accomplished in a will. Whatever your needs are, Attorney Garner will work closely with you and your family to insure that you successfully navigate through the complex probate administration and tax compliance requirements and offer solutions that will best protect your estate for the benefit of those you care about. A good will or estate plan also keeps the process of settling your estate as simple and efficient as possible. We offer a full range of estate planning and probate services to help you achieve your estate planning goals. We can recommend and implement a variety of estate planning techniques and services, from a simple will or low-cost will “package” to more complex solutions. The basic will “package” (a simple, economical way of obtaining the three most basic estate planning protection documents: a simple will, financial power-of-attorney and an advance health care directive). In some instances the basic will “package” may also include a Revocable Trust document. Drafting of financial and health care powers-of-attorney. Preparation of petitions for guardianship and conservatorship. Probate administration of decedent’s estates with or without a will. Assistance in the event of challenges to a will or disputes between heirs or beneficiaries. If you, a member of your family, or a friend has been charged with a crime or are facing a serious motor vehicle offense, it is important to obtain immediate legal advice and representation so as to safeguard important constitutionally guaranteed rights under our system of justice. Should you be the focus of a criminal investigation where the local police or other authorities are intent upon questioning you about potential criminal activity, prompt legal assistance should be obtained before meeting with the authorities. Without doing so, could mean the difference between acquittal and conviction. While the average citizen may feel far removed from the system of "crime and punishment", today's complex laws and criminal penalties often impact the lives of everyday people. In the area of motor vehicle offenses, for example, the penalties upon conviction can often involve the loss of your driver's license for periods of time that routinely run six to nine months even for the first time offender. The accompanying disruption in your family life and ability to maintain employment, can often be devastating. Recent policies attendant to domestic violence cases, the manner in which bail is set, the effect of minor and relatively insignificant convictions on ones immigration status and other circumstances can have long lasting effects on ones personal liberty. Advice and representation is critical to understanding the nature of any charge against you, evaluating your options and defending such charges. An attorney can guide you through the criminal process. Where appropriate, an attorney can present your case to a jury or judge for adjudication. In situations where convictions may seem inevitable, plea negotiations can be pursued with the goal of minimizing the penalty involved and the use of alternative sentencing arrangements where possible. Attorney Garner has been handling serious motor vehicle offenses and criminal cases for nearly thirty years. He has won acquittals before juries and judges throughout New Hampshire and Maine in DWI cases and other motor vehicle matters. Attorney Garner has successfully defended misdemeanor and felony level motor vehicle and criminal matters in a statewide practice throughout the New Hampshire Court system. In addition, he handles administrative motor vehicle matters before the Department of Motor Vehicles in Concord. He also has experience in other felony level cases before the Superior Court system involving theft crimes, felony level sexual assaults, drug offenses and a myriad of other criminal offenses. The Garner Law Office is a full service firm designed to assist individuals, families and small business owners with a comprehensive array of legal services and advice. Where appropriate a competent referral can and will be made to another legal professional who can best handle your concern and need for legal representation. With over thirty years of practice, Attorney Garner has worked across a broad range of legal areas and developed expertise in many fields of law. Whether you are in need of assistance in routine real estate matters, general civil litigation concerning contract disputes and problem solving, landlord tenant law or other civil disputes call this office and find out more about the services that are available to you. Foremost in handling any legal matter is a desire to offer competent, professional and affordable counsel to you. Regardless of whom you are or what you need, Attorney Garner will give you the close, personalized service you deserve. Whether dealing with routine matters or addressing more complex and life altering situations, Attorney Garner is committed to providing judgment and expertise. A larger law firm may seem impressive but may push your concerns onto paralegals and make it difficult to get hold of a lawyer. Attorney Garner maintains a small firm so he can give each client his full attention. This office is committed to keeping you informed and treating you fairly. You will receive a plain English explanation of the law, reasonable fees, telephone availability, email contact as needed, on time appointments, attention to details and communication regarding the status of your case. Fees for legal services are generally billed on an hourly basis . In most situations, an hourly rate is the only practical method of billing due to the fact that it is often impossible to determine in advance, the time that will be necessary to conclude a particular legal matter. What may begin as a relatively simple situation can change into a more complex case requiring time above and beyond the client's initial perception. At a client's initial consultation, every effort is made to make an honest assessment of the issues involved and to offer a range of likely fees that can be anticipated. In personal injury cases and worker's compensation matters, clients have the option of an hourly fee or entering into a contingent fee agreement. Most clients choose to elect to obtain representation in these matters on a contingency, which provides that the attorney earns a fee only after the client has obtained a monetary recovery by either settlement or order. The percentage fee varies based upon the type of case and other factors. In limited circumstances, flat fee billing is offered in the area of no asset bankruptcy cases, document preparation such as Deeds and Power of Attorney, as well as simplified Will preparation. An assessment of whether flat fee billing is appropriate can be discussed at an initial consultation. 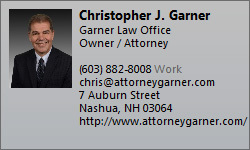 Attorney Garner has been providing legal services to individuals and families in New Hampshire for more than thirty years. Over that time, he has developed expertise in a wide range of areas. His extensive trial practice involves all aspects of complex divorce litigation, child custody and related family law matters. As a trained Collaborative Law professional and divorce and family law mediator he can provide the option of two forms of alternative dispute resolution for families in conflict. His expertise in serving as a former Guardian Ad Litem representing the interests of children in contested custody disputes brings a unique perspective to those clients who are facing difficult divorce and parenting issues. Mr. Garner is a member of the National Association of Consumer Bankruptcy Attorneys and a highly qualified consumer bankruptcy advocate able to guide clients through the difficult and complex process of Bankruptcy Law. Bankruptcy can offer individuals and families relief in the face of crushing debt, imminent foreclosure, harassment from creditors and provide a fresh start to a more secure financial future. Attorney Garner has successfully represented individuals in diverse areas of civil litigation in the Circuit and Superior Courts throughout New Hampshire including automobile accidents, premises liability cases and has appeared regularly in workers compensation matters at the NH Department of Labor. His wide ranging general practice also involves estate planning, probate administration, criminal law and real estate matters.